Domain parking is the technique to generate revenue from your unused domains. There are various domain parking companies which provide us domain parking facility. If you would list your domain names with domain parking companies then whenever a visitor come to your parked page and if he click on any ad then you will get revenue for that. All you need to do is that sign up for domain parking company and list your domain names that are unused and put your keywords for your domain names and give the proper category to your domain name. Then submit your domain name. Now change the nameservers from your domain name registrar to the nameservers which are provided to you by these parking companies. Now you just need to check the updated report for your parked domain name and see the quality of traffic you are getting. This is the general question asked in domain parking that why i need to park a domain and answer is simple you need to generate some revenue from your unused domain names. But suppose if you are a domain name investor and you have lot of domain names and then it is impossible for you to develop all the domain names then what you will do with your domain names? There is one best is to park your domain names with parking companies. If you are earning a at least 1$ in a month from domain name then you are in no profit no loss condition because in one year it will make $12 which is sufficient for its renewal. It also the indication of your domain is that it is not crappy domain name. So domain parking is good thing till than you are not using your domain name. 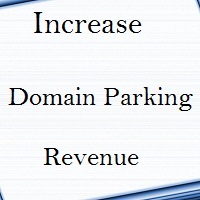 Increase domain parking revenue trick is very amazing trick to boost up your domain parking revenue. If you are getting traffic but CPC is very low then obviously are not generating amount of money from that kind of domain names. There is a trick which you can use is that you go to Google Keyword Tool and search for keyword that is high paying. Keep in mind one thing it will be very hard to get a domain name that is short in letters and paying high cost per click. So you need go with the longtail keywords. Longtail keywords may be three or more words and buy this longtail keyword domain name and put it in parking. See the results may one click on this longtail domain name can give you ten times more money rather then the short letter or regular domain name. So if you want to get sucess in the domain parking industry then buy the high CPC longtail domain names from your registrar and do not afraid of that longtail keywords may be crappy domain names do not worry for that because they are not crappy because they are generating good cost per click. We gets the high CPC or cost per click, traffic from UK ,US and Canada mostly.